In Otsego County’s Vanderbilt Area Schools, just down the road from Gaylord, two new teachers were hired this year—which might not sound like many. But in a small rural district, that number represents 20 percent of the teaching staff. 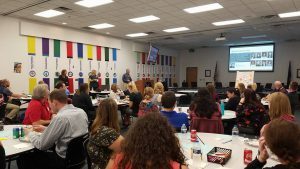 A New Teacher Club run by the Walled Lake Education Association provides probationary teachers with professional development and connection to colleagues. In the northern Michigan district of 110 students, only a couple of teachers have more than four years of experience in the profession. The lack of veteran educators combined with difficult socioeconomic factors in the community add up to big challenges for new hires. A new MEA-NEA pilot project aims to help by providing new educators with mentors who are master teachers. MiNewEd started last year in Cadillac and expanded this year to include MEA offices in Petoskey and Alpena, which serves Vanderbilt. “The Vanderbilt participants were excited about having a master teacher to assist them and be a resource for them to improve their professional skills,” said MEA UniServ Director Deb Larson. The pilot program joins with other union efforts at the local, state and national level to support new educators and prevent the loss of talented, promising young professionals—too many of whom are leaving the classroom in the first five years out of frustration and burnout. In Ann Arbor, 510 probationary teachers—including 120 teachers hired this year—are eligible to participate in monthly new educator meetings, sponsored by the Minority Affairs Team of the Ann Arbor Education Association. Only members in good standing are allowed to attend. Tamala Bell (left) is one of the Ann Arbor Education Association leaders who run a year-long program to connect and support early career educators. At one recent meeting, second-year participant Christopher Culbertson (right) presented ideas for incorporating Hispanic Heritage Month into the classroom. 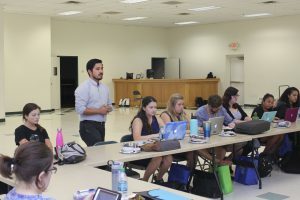 The program is so important for recruitment and retention that the school district pays for substitute teachers to fill in while the early career educators attend meetings to connect with others and receive professional development. The topics of the meetings are intended to be timely and immediately useful to new practitioners, Bell said, including legal rights and responsibilities, evaluations, community resources and outreach, special education, cultural awareness, teaching ideas and resources, and more. But there is an important emotional component, as well. “There’s a camaraderie that helps them realize they’re not alone, they have support, and they have another outlet to get ideas, share and collaborate,” Bell said. Some of the participants present ideas at the meetings and share materials in an online folder accessible to all. Fifth grade teacher Kelsey Lafferty is in her second year of the program, and she says the connection and collaboration with others has been invaluable. “The sum of our parts is greater than we’ll ever be as individuals,” Lafferty said. A similar effort in Walled Lake is drawing record numbers of probationary teachers to attend a New Teacher Club that goes beyond social events to acclimate and connect new members of the association, according to Daryl Szymanski, WLEA president. The first of five meetings provided an overview of curriculum and instructional practices. Other popular subjects include technology issues and hot topics in special education. The program is a member benefit for WLEA members in good standing, who receive credit for state-mandated “New Teacher Induction Hours” for attending. “All of us are needing to take on some sort of a role in caring for our newest teachers, just because the job is so overwhelming compared to what it was when I started 24 years ago,” Szymanski said. That was the impetus for members of MEA‑Retired to get involved in a separate initiative to support college education majors who are student teaching and belong to the Student MEA. The MEA‑Retired Mentoring Program was funded through an NEA grant and launched this fall. Retirees from across Michigan have volunteered to mentor a student teacher via email and phone. The veterans offer a variety of help: teaching ideas, solutions to classroom problems, and a place to vent that is safe and disconnected from the mentees’ university evaluations. Colleen Ford, who retired in 2009 from a 38-year teaching career in Flint, said she speaks at least weekly with her mentee—sometimes more. Everything they discuss is confidential. Ford says her job is simply to offer advice for any difficulty that arises during student teaching. Student teachers who would like to be assigned a retiree-mentor should contact Rebecca Ernst at RErnst@mea.org. Members of MEA‑Retired who wish to become a mentor can contact Lisa Andros at LAndros@mea.org.